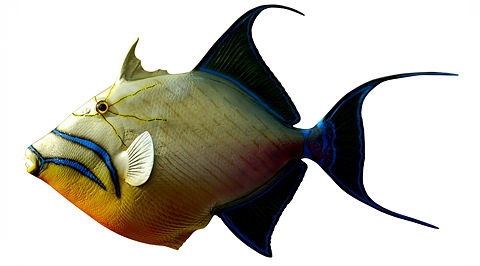 The Queen Triggerfish is a reef dwelling triggerfish of the Atlantic Ocean. They are one of nature’s most beautifully colored creatures. The Queen Triggerfish (Balistes vetula), known as the “Queen of the Reef,” is one of nature’s most beautifully colored creatures. They are normally found around rocky or coral areas and sometimes in underwater grass flats, either in schools or lonesome. In the wild they tend to prey mostly on urchins, starfish and other similar prey, but will eat most small fish if the opportunities arise. The Queen Triggerfish is fiercely territorial during its breeding season. When guarding their eggs, they are very aggressive and will chase and bit any intruders. Like other Triggerfish, the Queen Triggerfish has a dorsal spine that can be “triggered” into a locked position making it close to impossible to remove from a crevice. This system is also used as a defense against larger predatory fish species that might try to attack or eat them. Their base color is light yellow with green and blue markings on the body. Yellow and bright blue accents on the head and fins add to its amazing detail. In addition there are two broad diagonal and curved light blue bands running from the snout to below and in front of pectoral fins. The lowermost line continues with a blue ring around the lips; a broad blue bar across caudal peduncle, and blue sub-marginal bands in the median fins. Their eyes are positioned high on their head allowing them to scan for prey. They have a small but powerful mouth with very strong teeth.